Like most physicians, Dr. Jonathan Reid regularly makes difficult life-or-death decisions. But his dilemma is quite unlike what other doctors face: Does he heal each Londoner he encounters or satisfy his horrible craving? London, 1918. You are newly turned Vampyr Dr. Jonathan Reid. As a doctor, you must find a cure to save the city’s flu-ravaged citizens. As a Vampyr, you are cursed to feed on those you vowed to heal. Will you embrace the monster within? Survive and fight against Vampyr hunters, undead skals, and other supernatural creatures. Use your unholy powers to manipulate and delve into the lives of those around you, to decide who will be your next victim. Struggle to live with your decisions…your actions will save or doom London. © 2018 DONTNOD Entertainment and Focus Home Interactive. 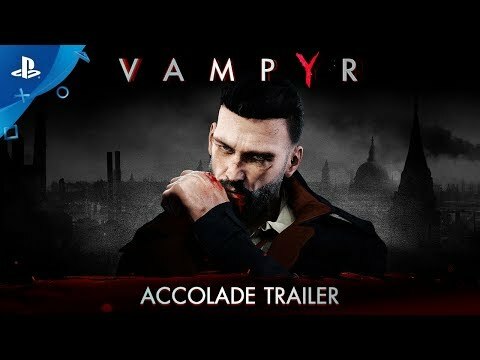 VAMPYR is developed by DONTNOD Entertainment and published by Focus Home Interactive. VAMPYR and its logo are registered trademarks of Focus Home Interactive. All other trademarks or registered trademarks belong to their respective owners. All rights reserved.